I really wanted to like this sweetener. I wanted to LOVE it. In fact, I started to love it before I even got it. I dreamed of all the very low glycemic index foods & drinks I’d be able to enjoy while getting my health in order. I was a bit skeptical, though, as every natural, alternative sweetener has been very disappointing in flavor. Trim Health Mama (THM) is an eating plan to help people (not just women) lose weight & restore health. The basic premise is to have protein as the main part of every meal & snack. For “S” meals, you have protein with fat & non-starchy vegetables. For “E” meals, you have protein & a small about of healthy carbs. You wait about 3 hours between meal & snack types. I’ve lost 6 pounds in three weeks following these principles. So I was really looking forward to liking this sweetener! 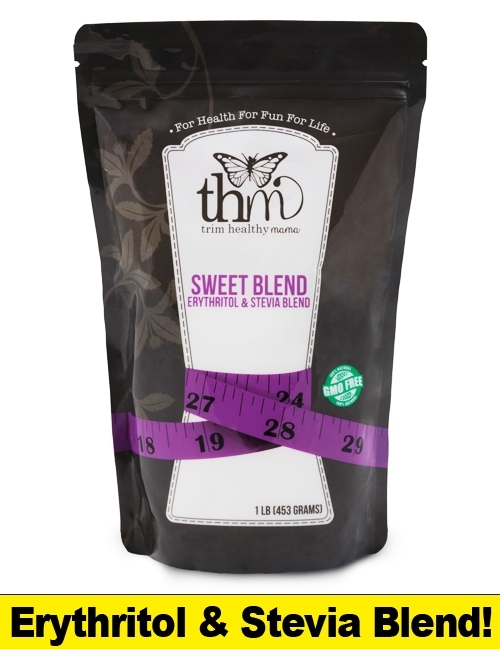 THM Sweet Blend is a blend of erythritol, a sugar alcohol that has no effect on glucose levels, and stevia. I think everyone is familiar with stevia. I have never liked stevia but everyone said such wonderful things about THM Sweet Blend! “It’s just like sugar”, they exclaimed. “It’s so yummy”, “Best sweetener ever”, and so on. I knew it wouldn’t be JUST LIKE SUGAR. I was not expecting that. I was expecting a great tasting stevia based sweetener with a slight bitter aftertaste (even though everyone said there was no bitterness). My Sweet Blend finally arrived! But…my husband misplaced the mailbox key! I was sooo anxious to try this sweetener & take my THM regimen to the next level! He found the key the next day & started using the sweetener. To my surprise…it TASTED GOOD!! Great, in fact!! I said to myself “Wow, I can enjoy a stevia-based sweetener! I can make yummy low carb goodies & stay on-plan! I can enjoy frozen mochas & continue losing weight!”. I used it in my Singing Canary drink (recipe to follow) which I drink every day. This drink is already delicious but with Sweet Blend it was FAB!! I was so pleased! I made dinner (pizza with cauliflower crust, a THM recipe). That was yummy, too! I drank my Singing Canary after dinner, and got a bad stomach ache. I thought it was from too much pizza. I’d had an extra slice, after all. The pain lasted all night, and all the next day. I was upset because the pizza was really good! I wanted to eat something but my stomach was just not in the mood. I ate a little yogurt with some Sweet Blend. I felt better for a few minutes then the pain came back. I ate a spoonful of yogurt every 20 minutes or so, thinking the probiotics would help somehow, and the creaminess would soothe my stomach. I was wrong. I felt like I was on the verge of vomiting for the rest of the day & through that second night. The next morning I was 100% better. There are dozens, if not hundreds, of people who use THM Sweet Blend daily & have no problem with it. It’s $10 for a pound, you can buy it here. You can also get the Trim Healthy Mama book, eBook, and other sweeteners. Singing Canary is a drink designed to help heal adrenal fatigue. Here’s the recipe from The Laundry Moms! My comments are in (parentheses). 4000mg of buffered Vitamin C powder, without sugar. Directions: 1. Peel only the yellow rind off two lemons using a sharp pearling knife, leave as much of the white pith intact (the bioflavonoids in the white are an important, healing component of the drink). Slice each lemon into four chunks, take out the seeds and throw lemon pieces into your blender with 3 cups of water. If you use a high speed blender, such as a VitaMix, it’s okay to leave the seeds in. Blend well. 2. Time to sieve this liquid because as you’ll want your Canary smooth and creamy. The easiest way is to pour the ingredients through a nylon mesh bag into a bowl or pitcher. You can purchase these bags at a paint store very inexpensively. Squeeze the bag well and allow all the lemony goodness to ooze out. (I use cheesecloth folded over 3 or 4 times or a fine sieve) It’s worth a trip to the paint store for a few of these bags as you can make homemade cheese and almond milk with them. If you want to make this drink now and you don’t have a bag, then use an old nylon stocking or a fine sieve. 3. Pour your fresh juice back into the blender. Add all the other ingredients and blend (for about 30 seconds, if using a high speed blender). 4. Fill a two quart glass mason jar with ice to the tippy top and then pour your SINGING CANARY juice over the ice. If it doesn’t reach the top then add more water to your jar. 5. Put on a lid on the jar and shake like you are a professional drink mixer. Drink between meals every day.